The Emergency Medical Technician (EMT) program provide learning experiences that enable the student to acquire and assimilate the necessary technical competencies to function effectively as an EMT responding to medical emergencies in the pre-hospital environment. An Emergency Medical Technician is the intermediate care practitioner in Emergency Medical Services. These individuals are the first to arrive on a scene and provide the initial assessment and direct patient care in the pre-hospital environment, as well as in emergency rooms, clinics, and ambulance services. The Medical Campus Emergency Medical Technician program is a one semester program of study requiring 11 credits. 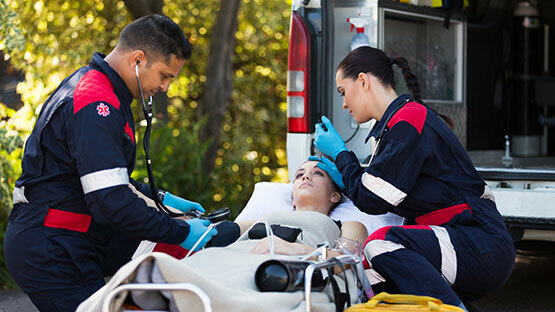 Before entry into the Emergency Medical Technician program (EMS 1119, EMS 1119L, and EMS 1431), the student must have completed training as a First Responder or equivalent and college prep coursework or higher to be eligible for these classes. (See Testing Requirements for program). If students must work for financial support, the program strongly recommends a limit of 20 hours of employment per week during program enrollment.